Only 12, but making a difference! At age nine, Makenna Breading-Goodrich of Surprise, Arizona saw a news report about how cold it gets at night and what homeless do to stay warm. She knew she could do something to help and started to collect warm clothes to distribute in her community. “It gets really cold around here at night, like 30 degrees, and I want to make sure homeless people aren’t walking around without jackets or blankets at night,” Makenna explained. Makenna created some fliers to post and went door-to-door with a red wagon collecting donations. She hands out coats, gloves, scarves and hoodies. 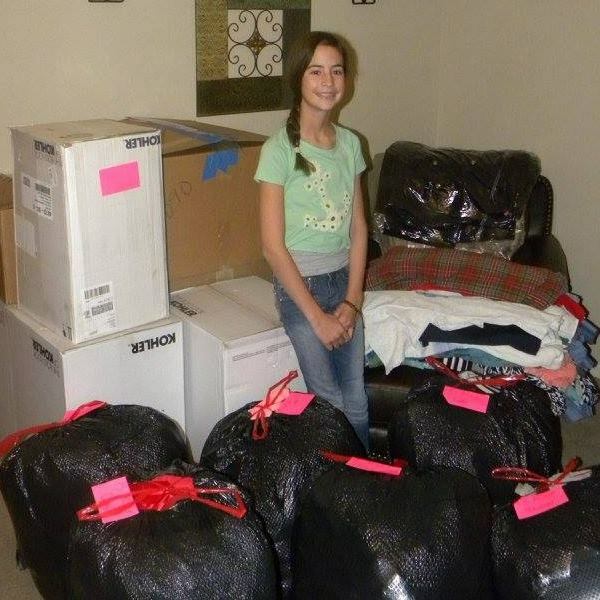 Makenna’s Coats for a Cause grew into collecting bottles of water for the homeless in the hot Arizona summers. Now, at 13, she has enlisted help from friends, family and her softball team. Our hats are off to you, Makenna. Your attitude and drive are inspirational. Keep up the great work.